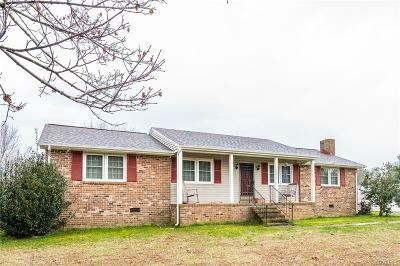 Brick Rancher, 3Br/2Ba sitting on 2.66 +/- acres (2 lots) with a LOT of storage and room to grow. This home offers a spacious eat-in kitchen with an island to serve your guess. New remolded kitchen (2016) includes granite counter top and brick layered tiled back splash. There are additional updates to include hallway bathroom, front door, back doors, and windows. There is large living room and paneled family room with a brick gas log fireplace to enjoy. Never have to worry about being in this home without electricity with the comfort of a whole house generator. This property includes a 25'x25' two-car metal garage and 32'x12' workshop. Directions: I-85 South To U.s. 460 W To R On Trinity Church Rd. (At Poole Siding). Bear Right Onto Cox Road To Property On Right.